Compare brand new Suzuki Ignis Hatchback lease deals! All Ignis Hatchback deals include delivery, road tax and a full manufacturer’s warranty. We collect the best Suzuki leasing pricing from across the industry, saving you time and money. Select a trim below to get started. 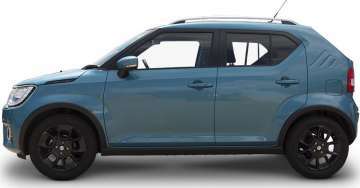 Which Suzuki Ignis Hatchback Trim Should I Choose? Suzuki knows more about Crossovers than just about any other manufacturer. Here's its smallest one, the Ignis. It's a compact, affordable and very stylishly-formed way to make a statement in the city and cruise through the country. Let's try the top 4WD mild hybrid version. Here you can view the pricing history for the Suzuki Ignis Hatchback on LeaseFetcher. How long is the warranty on the Ignis Hatchback? Suzuki offers a 3 year or 60000 mile warranty , whichever comes first . What is the cheapest Ignis Hatchback option? The Ignis Hatchback is the cheapest to lease. It costs just £135.25 per month with an initial payment of £1,217.27. That's for a 4 year deal with 8,000 miles.